Purple WiFi provides cloud-based public WiFi hotspot software in 50 countries. The authentication method for login uses social media channels including Facebook, Twitter and LinkedIn. Venues can request that users “like” or “follow” them, with free WiFi access in return. Customers in public venues have come to expect free WiFi, but traditionally it hasn’t offered much benefit to the provider. Purple WiFi’s solution changes that, offering a seamless combination of free, family-friendly WiFi for your customers and real-time marketing analytics for you. Implementing the Purple WiFi solution also means that you’ll benefit from a range of features including presence analytics, content filtering and even geo-fencing technology. By accessing our Purple Portal, you will be able to view in-depth information about your WiFi users, including their age and gender, frequency of visits, their location and dwell time. As Purple WiFi is offered in line with industry best practice, you will not have to worry about the legal and security implications of being a public WiFi provider. The WiFi network will be completely secure and your customer’s privacy is protected at all times. With Purple WiFi the possibilities are endless. The solution can be tailored to suit any sector, from retail and hospitality to education and healthcare. 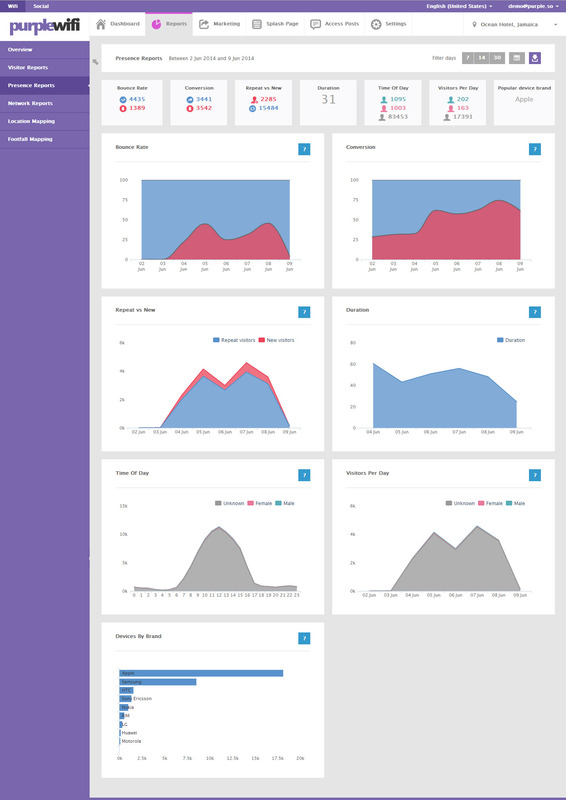 WiFi Analytics – Through the Purple Portal, you will be able to view real-time customer data. Demographics include age, gender, location, data usage, the amount of users and length of internet use. This information allows you to segment your audience and create personalised marketing campaigns. WiFi Marketing – The portal’s array of marketing tools allow you to monitor activity and promote your business. You can choose to customise the offline and online splash page with your branding and advertising. Using this combined with analytics and unique e-shots will enable you to target your audience effectively. Location Based Services – We can now include RSSI date to our system, allowing retailers to see the detail of people’s pathways through the store, their entry and exit points. The insights gained from presence analytics mean that marketing campaigns can be targeted to your customers. For example, the position of sales displays can be adjusted when a common pathway through the store is identified.ll time.